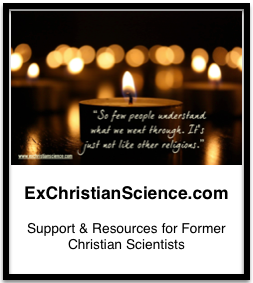 What are ways that your Christian Science community has supported you? What are some things you would like to see in your CS communities? What role do organizations that serve Christian Scientists play in supporting young adult community and connections? Why do young adults disengage with CS communities? Would you have any interest in joining a discussion on these topics? [Redacted] is trying to connect with a broad audience – whether you attend church or not, there is a discussion for you! The last question, Why do young adults disengage with CS communities? hit a nerve. A better question is how are young adults staying in CS in 2017? If they want to know why people are leaving Christian Science they should do a quick read of this blog (or any of the other blogs), support sites, published memoirs, or skim a few pages of CHILD’s website. This is not a difficult question. It is a little late for hand-wringing over what went wrong. The stories are horrifyingly similar: my aging parent/friend/relative is in CS and dying a horrible slow death. As a child I was denied appropriate medical care. I have life long emotional, psychological, physical scars from my CS upbringing. Take your pick, sometimes it is all of the above.